Where Recycled Car Parts Become Time! Inspired by personal experience, I began re-purposing old car parts into clocks when I was changing the front brake rotors on my Jeep. I noticed I had created a pretty good-sized groove in one of them and thought "this would be a cool clock!" After cleaning it up and sanding it down, I began my creation. Taping off what I didn't want painted and where the original metal would show through, I began to paint. After selecting the perfect clock hands and numbers, I added them onto the brake rotor and ended up with a great looking brake rotor clock! I had no expectations to do any more since the clock was just something personal to me but after so many people came through my home and complimented me on the uniqueness, I decided I would make more for friends and family. 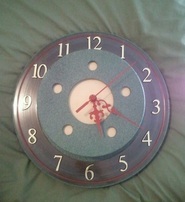 I now offer these one-of-kind, handmade, car part clocks for sale so that others can enjoy the uniqueness of time in their own home! My name is Kayla. My career is as a dental assistant but evenings and weekends when I have time, I create clocks from car/motorcycle/boat parts. I have a ton of fun creating these timepieces from all the different parts I find and parts I'm given, and turning them into functional art that people love to have. Each clock is unique. I do everything by my own hand which ensures that no two are ever alike. This hobby just happens to encompass my love of cars with my love of painting and creating. 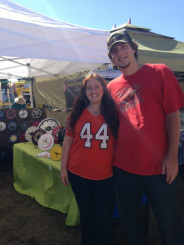 My husband BJ, helps me with making these clocks come to life. He is my master fabricator! He supports me all the way and I couldn't have done any of this without him! The MORGAN Project is a non-for-profit organization dedicated to promoting awareness and facilitating families of children/young adults with the proper equipment to help fit their needs. They aim to give families with special-needs children a better quality-of-life! They are not disease-specific and try to assist special-needs families in any way they can. They also have a multi-sensory sensorium, Morgans's Place, located in Melbourne, Fl. Brake Time Clocks supports The MORGAN Project and donates a portion of proceeds to the organization!